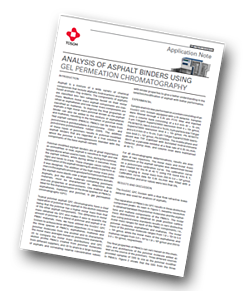 Tosoh Bioscience has produced an application note describing the analysis of asphalt binders using gel permeation chromatography. The components (asphaltenes, maltenes, and polymer) of three different polymer-modified asphalt cements (PMACs) were characterized by GPC. The method can be applied to correlate relative concentration values of polymer molecules in asphalts. Sample analysis was performed on a system consisting of an EcoSEC GPC System equipped with a RI detector. For all chromatographic determinations, results are averages of two injections. The molar mass and molar mass distribution of the asphalt samples was determined based on a polystyrene calibration curve. Further conditions are given in the application note. The EcoSEC GPC System with a dual flow refractive index detector was used for analysis of asphalts. The final properties of PMACs can vary based on the chemistry and architecture of the polymer molecule added as well as the source of the polymers. Three different sources provided samples of SBS to use as the polymer modifier in PMACs. The EcoSEC GPC System with a dual flow RI detector was successfully used to separate the three species of PMACs, asphaltenes, maltenes and polymer molecules from one another and to characterize the molar mass averages based on polystyrene standards. GPC analysis of asphalts results in a chromatogram with near baseline resolution between the polymer molecule and the asphaltenes and maltenes. 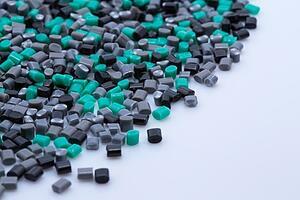 The GPC elution profiles were used to compare SBS polymer from three different suppliers. The SBS from each supplier varied in elution profile, modality and molar mass. Finally GPC was successfully used as a method for correlating relative concentration values of polymer molecule in asphalts. The use of GPC for the characterization of asphalts and PMACs proves to be a very versatile method.